We’ve seen some pretty spectacular examples of maintenance management gone wrong recently. In February, authorities ordered the evacuation of 188,000 people downstream of the Oroville Dam in California, over fears that erosion to the spillways could result in uncontrolled flooding. The National Parks Service has been thrust into the spotlight because of its dramatic maintenance backlog, and the nation’s infrastructure—from schools to drinking water, energy, and hazardous waste—was recently categorized as “at risk”. A few months ago, the American Society of Civil Engineers (ASCE) published its 2017 Infrastructure Report Card, giving American infrastructure an overall grade of D+. 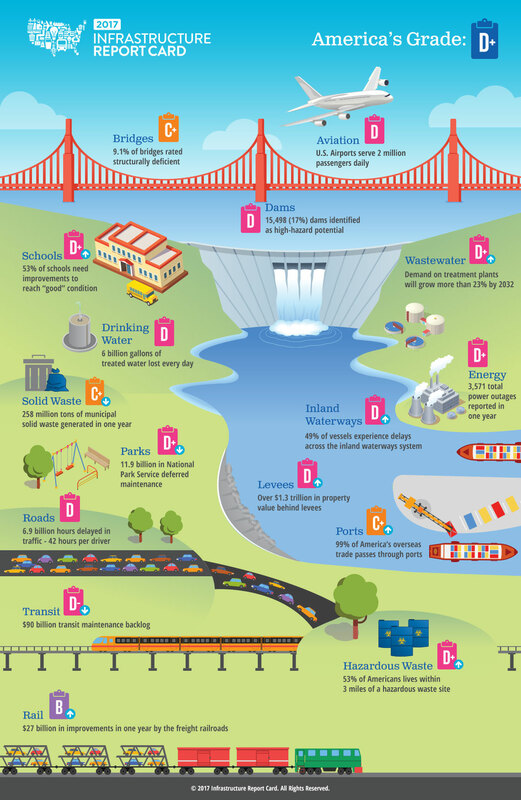 The ASCE releases the Infrastructure Report Card every four years. The organization is made up of 28 civil engineers who volunteer their time to assess data, talk to industry experts, and assign the grades based on eight key criteria including funding, condition, operation and maintenance, public safety, and resilience. Overall, the slow degradation of America’s infrastructure probably won’t trigger an event of biblical proportions. The risk is much more insidious and extremely costly—the ASCE projects that the US will have to invest $4.59 trillion by 2025 to get the nation’s infrastructure up to a passing grade of B. Bad infrastructure is bad news for everyone. Take transport for instance—If roads, waterways, ports and airports get worse, shipping goods will take longer and become more expensive. At home, businesses and consumers will have to shoulder these increased costs. Higher transportation prices will affect domestic manufacturers since higher export costs will impact demand for US goods, and hurt America’s ability to compete in global markets. The how and why in this scenario are complex, political, and hard to pinpoint: How did we get to this place, and why has a more pragmatic approach not been taken to cope with it? We’re willing to take a stab at one small piece of the puzzle: We live in a world that chronically sidelines maintenance. Anyone working in the field will tell you that maintenance is overwhelmingly seen as a cost centre, something to bow to budget and schedules. It’s recognized in theory as valuable and yet there seems to be a massive disconnect when it comes to actually implementing it. In an essay titled “Hail the Maintainers” Andrew Russell and Lee Vinsel—dean and professor in the college of arts & sciences at SUNY Polytechnic Institute and assistant professor of science and technology studies at the Stevens Institute of Technology, respectively—float a theory of where this disconnect is happening. They outline historical events that created the conditions for large swathes of our society to favour shiny new innovation at the expense of more mundane concepts like maintenance. One of the issues that Russell and Vinsel point out is that focusing too much on innovation doesn’t leave room for older technology; the stuff we encounter daily that’s less novel but arguably more important. “Yes, novel objects preoccupy the privileged and can generate huge profits. But the most remarkable tales of cunning, effort, and care that people direct toward technologies exist far beyond the same old anecdotes about invention and innovation,” write Russell and Vinsel. Generations are growing up in a world that is too keen on creating something new, rather than taking care of what we have and this risks leading to a shortage of maintenance professionals. In fact, one of the big challenges for the asset management market over the next four years is expected to be a lack of expertise in the field. There are two sides to this problem: The first is that maintenance and asset management as a career isn’t well known to the general population. This is problematic because the demand for maintenance professionals is rising significantly faster than the average for other American jobs. 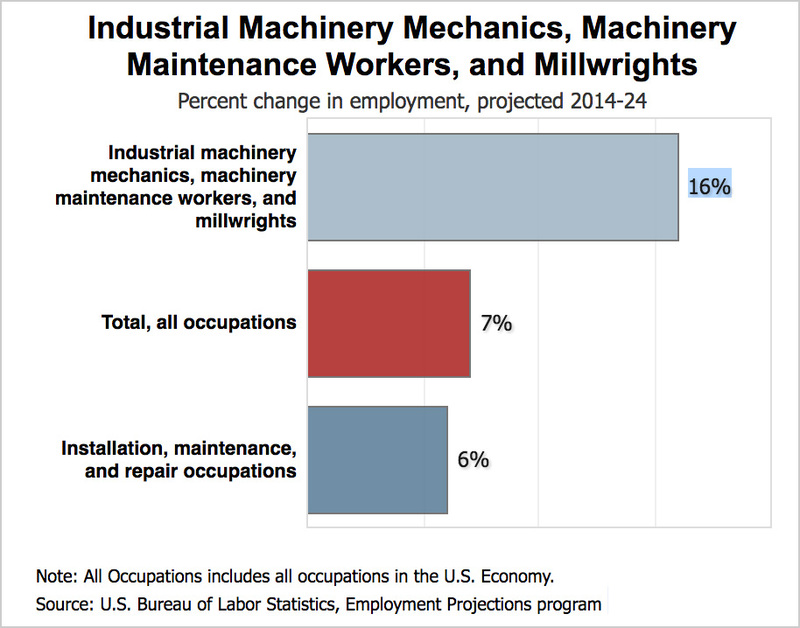 According to the Bureau of Labour Statistics’ Occupational Outlook Handbook, in 2014 there were 464,400 skilled maintenance jobs in the US, which includes industrial machinery mechanics, machinery maintenance workers, and millwrights. This number is projected to grow by 16 percent between 2014-2024, injecting 73,400 jobs into the market. Jobs that risk remaining unfilled as fewer and fewer people pursue maintenance as a career. The other issue facing the market is that this lack of awareness is infiltrating the executive level of many companies, creating a culture where maintenance is, at best, misunderstood, and at worst, invisible. A MarketsandMarkets report on the five-year forecast for the global enterprise asset management market suggests that ignorance at the executive level means a lot of organizations misunderstand the relationship between regulatory objectives, company goals, and their maintenance department, which creates friction between these pieces of the business. And when the executive level doesn’t understand the importance of the maintenance team, budgets get cut and small fixes are left undone until bigger problems pop up. This has landed many organizations (as well as a big chunk of American infrastructure) in a reactive maintenance sinkhole, where planning and foresight are secondary to just fixing the most broken thing. It’s an expensive and dangerous way to work, and completely avoidable. There are tools available—maintenance management software and strategies—that are focused on moving facilities away from the run-to-failure mindset, towards anticipating when maintenance will be needed. However, because there can be a disconnect between maintenance teams and upper management, the latter doesn’t always see a linear relationship between these tools and more efficient organizations. So convincing management to invest in something like maintenance management software can be a big job in itself, and most maintenance workers are too busy trying to stay on top of the work to build a business case. Oftentimes the money never comes and the problem remains unsolved. Things break down, and the more we use them the more they break. It’s a simple concept, and yet we continue to see examples of how underfunded maintenance is pandemic in America. 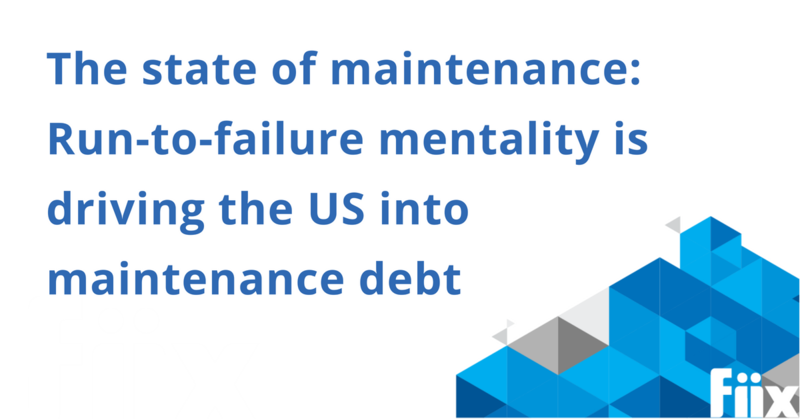 The infrastructure issues in the US are just one really big example of how devaluing maintenance can cause trouble. In fact, of the ASCE’s 13 recommendations for how to close the infrastructure investment gap, four are directly related to investing in and prioritizing maintenance. In the most basic terms, we need to ditch the “fix it when it breaks” mentality, and start understanding the value of preventive maintenance. Want more from Fiix? Read our article on the state of American manufacturing.